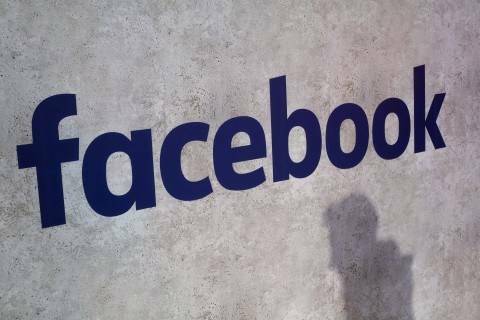 The massive trove of Facebook ads House Intelligence Committee Democrats released Tuesday provides a stunning look into the true sophistication of the Russian government’s digital operations during the presidential election. We’ve already heard a lot from the U.S. intelligence community about the hacking operation Russian intelligence services carried out against Democratic party computer networks to influence the election in favor of then-candidate Donald Trump. But this is the first time we have a swath of empirical and visual evidence of Russia’s disinformation campaign, in the form of more than 3,000 incredibly specific and inflammatory ads purchased by an Internet troll farm sponsored by the Kremlin. The ads clearly show how Russia weaponized social media, the senior Democrat on the panel investigating Moscow’s interference in the presidential election said. By exposing these Russian-created Facebook advertisements, we hope to better protect legitimate political expression and safeguard Americans from having the information they seek polluted by foreign adversaries. Sunlight is always the best disinfectant. The 3,500 ads purchased by the Kremlin-backed Internet Research Agency, or IRA, were funneled with laser precision to narrow categories of social media users. My colleague Tony Romm reports that the troll farm used Facebook's targeting tools to deliver the Russian-fed propaganda to a range of specific user groups, from black or gay users to fans of Fox News. He writes: “In many cases, the Kremlin-tied ads took multiple sides of the same issue. Accounts like United Muslims of America urged viewers in New York in March 2016 to ‘stop Islamophobia and the fear of Muslims.’ That same account, days later, crafted an open letter in another ad that accused [Hillary] Clinton of failing to support Muslims before the election." A Russian Facebook advertisement released by the House Permanent Select Committee on Intelligence. The IRA sought to capitalize on the controversy over NFL players kneeling during the national anthem—and even, as Tony found, get people to protest for and against Beyoncé. NBC reports that the ads even shopped anti-immigrant messages to fans of specific Fox News personalities such as Sean Hannity and Bill O’Reilly. This effort to lure social media to engage with Russian-fed propaganda like this clearly required a sound knowledge of Americans and their politics that is especially staggering when you see the ads in full. This type of “hybrid” cyberoperation is the new standard for state-sponsored election interference campaigns, said Peter W. Singer, a strategist at the New America think tank. “The future of these campaigns is hybridization — in terms of state and criminal actors working together,” Singer told me. Going forward, he said, we’ll see more “attacks targeting both the networks and the beliefs and conversations of people behind the networks." As Singer notes: “When it comes to cyberoperations and information warfare or influence campaigns, the way we conceive of them is we keep them separate.” But, as the ads make very clear, Russia “didn’t separate them,” he said. The ads on Facebook and Instagram reached at least 146 million people between mid-2015 and mid-2017. Facebook acknowledged Thursday it had not anticipated the two-pronged approach. “In the run-up to the 2016 elections, we were focused on the kinds of cybersecurity attacks typically used by nation states, for example phishing and malware attacks. And we were too slow to spot this type of information operations interference,” the company said in a statement. The ad trove adds color to details about the IRA that we already know from special counsel Robert Mueller’s investigation into election interference. Mueller’s charges against 13 individuals and three companies included conspiracy to defraud the United States, and conspiracy to commit wire fraud and bank fraud. PINGED: Researchers from University of California at Berkeley published a paper showing "they could embed commands directly into recordings of music or spoken text" for virtual assistants like Apple's Siri or Amazon's Alexa that a human can't detect, the New York Times's Craig S. Smith reports. "So while a human listener hears someone talking or an orchestra playing, Amazon’s Echo speaker might hear an instruction to add something to your shopping list." "These deceptions illustrate how artificial intelligence — even as it is making great strides — can still be tricked and manipulated," Smith writes. One of the researchers said it may only be a matter of time before someone starts exploiting this technique. “My assumption is that the malicious people already employ people to do what I do,” Nicholas Carlini told Smith. PATCHED: The encryption fight is still simmering. A bipartisan group of House lawmakers yesterday introduced a bill that would prevent law enforcement agencies from forcing companies to install encryption back doors in their products. The group that introduced the bill — called the Secure Data Act of 2018 — includes Reps. Zoe Lofgren (D-Calif.), Thomas Massie (R-Ky.), Jerrold Nadler (D-N.Y.), Ted Poe (R-Tex. ), Ted Lieu (D-Calif.) and Matt Gaetz (R-Fla.). Bill outlook: Unlikely. #Libertarian Republicans and more liberal leaning House reps are behind the move. Probably won't get major support from either party. Similar folks behind updates to #FISA are behind this bill. PWNED: A cybersecurity firm focusing on protecting industrial control systems said a group of hackers called Allanite is gathering intelligence inside electric utilities in the United States and Britain. Dragos said it has “moderate confidence” that the group is doing so in part to "have ready access from which to disrupt electric utilities." “While the U.S. government and private sector companies have linked Allanite activity to Russia, Dragos says it 'does not corroborate the attribution of others,' " SecurityWeek's Eduard Kovacs writes. And for a deep dive into Dragos's work, you can read this recent story from The Washington Post's Ellen Nakashima and Aaron Gregg. 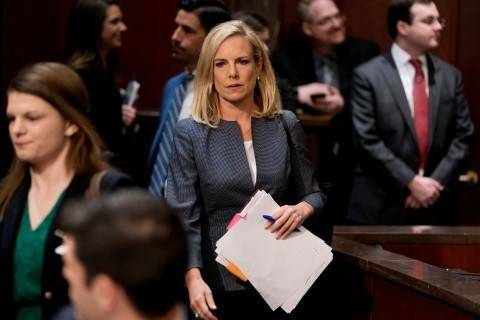 Administration officials deny Kirstjen Nielsen is planning to resign following the heated Cabinet meeting. There are 11 steps and one recommendation. — Today is the first anniversary of President Trump's executive order on cybersecurity, and the administration is expected to mark the occasion with the release of a report on confronting botnet attacks, Inside Cybersecurity's Charlie Mitchell wrote. A source told Mitchell that “the botnet report is on track for release on Friday and will build on comments submitted on the draft.” The draft report was released in January. —Del. Eleanor Holmes Norton (D-D.C.) and Rep. C.A. Dutch Ruppersberger (D-Md.) introduced a bill to offer free lifetime identity protection to federal employees whose personal information was compromised in the 2015 breaches of Office of Personnel Management. Under current law, the OPM is only required to provide the coverage through fiscal year 2026, according to a statement from Norton's office. — The Federal Communications Commission announced yesterday that Obama-era net neutrality rules, which the panel voted to repeal in December, will effectively end June 11, Reuters's David Shepardson writes. “The effect of this will be better, faster, cheaper Internet access and the free and open Internet that we have had for many, many years,” FCC Chairman Ajit Pai said. — Score one for privacy advocates: “A federal judge denied the Trump administration’s request to throw out a lawsuit challenging the right of border agents to seize and search the mobile phones and laptops of U.S. citizens without warrants or a showing of probable cause,” Bloomberg News's Erik Larson reports. “Plaintiffs have plausibly alleged that the government’s digital device search policies substantially burden travelers’ First Amendment rights,” U.S. District Judge Denise Casper wrote Wednesday, as quoted by Larson. The American Civil Liberties Union, the Electronic Frontier Foundation and the ACLU of Massachusetts sued the Department of Homeland Security in September on behalf of 10 U.S. citizens and one lawful permanent resident. This is a win for constitutional rights at the border, where privacy violations are skyrocketing. No one should be forced to give up their rights in order to travel. — The official who protected both President Obama and Trump from getting hacked is headed to the office-sharing company WeWork, Recode's Shirin Ghaffary reports. Sen. John Hoeven (R-N.D.) said the government should coordinate its cyberdefense policy across several federal agencies as well as with the private sector. He said the Department of Homeland Security should continue to have that responsibility. "Make sure that this issue is front and center,” Hoeven added. The Trump administration is expected to release a report on botnet attacks. Cloud Security Alliance Federal Summit on May 15. Adobe Digital Government Symposium on May 15. Senate Judiciary Committee hearing on Cambridge Analytica and data privacy on May 16. USTelecom Cybersecurity Policy Forum on May 16.